I could not think of a better way to kick off my blog than to give everyone a peak into the my favorite corners of my home. I have spent a lot of time over the years collecting art, furniture, and other decorative odds and ends that I truly love. To me, the most beautiful homes are filled with personal artifacts, contain pieces full of meaning, and say something about the people who reside there. I am very blessed to have many creative people in my family, and relatives with good taste that have been generous enough to pass beautiful things down to me. I try to not accept items that I don't have a spot for, or anything that doesn't fit well into my home. I am constantly decluttering, and clutter is a huge source of stress for me. In order to maintain my inner peace and sanity, I need to keep up an orderly home. When I look around my humble apartment, I am inspired by what I see and am reminded of how fortunate I am to have so many incredible friends and family. I also am lucky to have a wonderful roommate, my oldest friend, who has given me free reign with decorating our shared space. Many people are hesitant about decorating a rental, because they do not want to invest too much time or money into a place that is not permanent. Though I wouldn't recommend doing any major renovations, inexpensive upgrades such as painting, installing window coverings, and making purchases that you can take with you (such as flexible furnishings, art, and textiles) are well worth the investment. I have decorated my current space, as well as my two previous apartments, on a very tight budget. Even if you live in a temporary place, making it feel like home, and turning it into a space where you love to spend time, really makes a difference. I hope you enjoy the quick peak inside my home and see something that inspires you. I am constantly changing things around. In fact, a couple of things have actually changed since I snapped these pictures the other day! I love that my space is constantly evolving, reflecting my taste, creativity, and how I am perpetually growing and changing personally. I love entertaining, and cooking for my friends and family, so my dining area is one of my favorite spots in my home. The Scandinavian style dining set is a hand-me-down from my parents, and opens up to an extra long table about 8 feet long which is great for parties! I have used it for sit down dinners, and as a buffet table where guests can help themselves. The beautiful impressionist paintings behind the table were done my talented grandmother Millie Greene. The candle sticks are from Anthropologie, the vase is a discontinued design by Jonathan Adler, the table runner is vintage (a gift from my mom), and the cat is Tokyo (who always demands to be the center of attention). 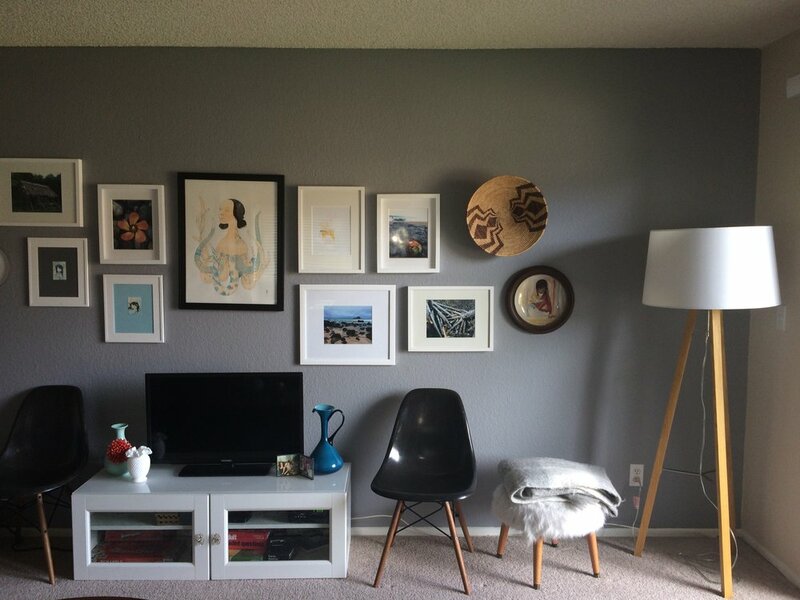 The gallery wall in my living room is one my favorite things that I see when I walk into my house. The pictures are a mix of originals and prints off of etsy.com, photos from my family's trip to Maui two summers ago, decorative plates and baskets, and a dream catcher that I made from roving fiber, yarn, feathers, and an embroidery hoop. It is one of my favorite DIY projects and love the texture that it adds. The two chairs that reside on either side of the TV console are vintage Eames shell chairs which were probably the biggest splurge in my home. They act as extra seating when I am hosting many guests, extra chairs for the dining room table, and I love the sculptural element they add on their own. The ottoman is a vintage bargain that I recovered, and the lamp is from West Elm. I love the conversation area in my living room. Its such a wonderful place to relax with friends, watch tv, or snuggle with my kitties. My couch is from world market, the grey chair was a leftover prop from one of my dances last year, the cream chair is from Restoration Hardware, and the coffee table is another vintage find. Two of my favorite elements are the end table next to the couch and the dressing stand in the entry way, which were built by Brian Carnett, my talented father. I am so lucky to have a few of his beautiful pieces in my house. On the coffee table I have a custom painted antler purchased of etsy.com by Cassandra Smith. The gold vessel is a paper mache etsy find from Up In the Air Somewhere. It is filled with beautiful silver hearts that my mom has been collecting and giving to my sister and I over the years. So special! 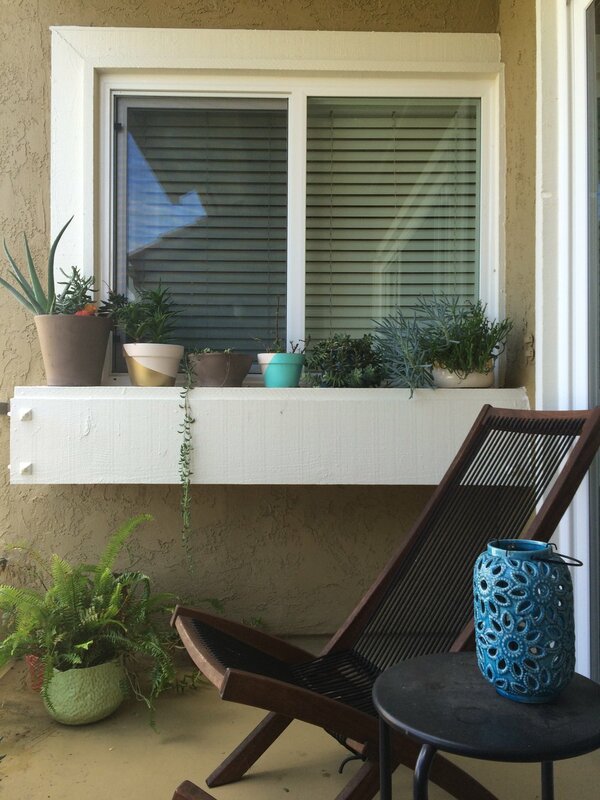 The white honeycomb vase is from West Elm. I had to give you a close up of this corner to show off my fiddle leaf fig! These trees are notoriously finicky, and I have managed to keep this one alive for three years with minimal effort. On the end table I also have a vintage milk glass vessel to hold keys and other odds and ends, a turquoise vase which was a gift from my aunty, and coasters from Anthropologie. I have a gorgeous handmade quilt, made by my mother, hung on the wall in the hallway as you walk towards my bedroom. I smile whenever I see it. I am very lucky to have a large bedroom with room for an office nook. The picture above is of one of my favorite vignettes on the top of my bookshelf that resides next to the window, behind my desk. The picture is by Stasia Burrington, the white vessel is vintage milk glass, the canister is my one of my favorite ceramic artists Ben Feiss, the brass dancer is a gift from my sister, the blue and purple pot is a souvenir from Maui, the carved brown box was handed down from my mom, and the white bird is another piece by Jonathan Adler. Across from the bookshelf is my little desk and work space. The desk is from target, the the bentwood chair is a vintage find. The area over my desk is filled with artwork and family photos that inspire me. It's wonderful working here and looking up to see all of the faces of the people I love. The lamp and clock are from Ikea, the milk glass canister is vintage, and the tin heart on the wall is something I bought with my mom on one of our shopping trips in Old Town. Above is the view from my bed. 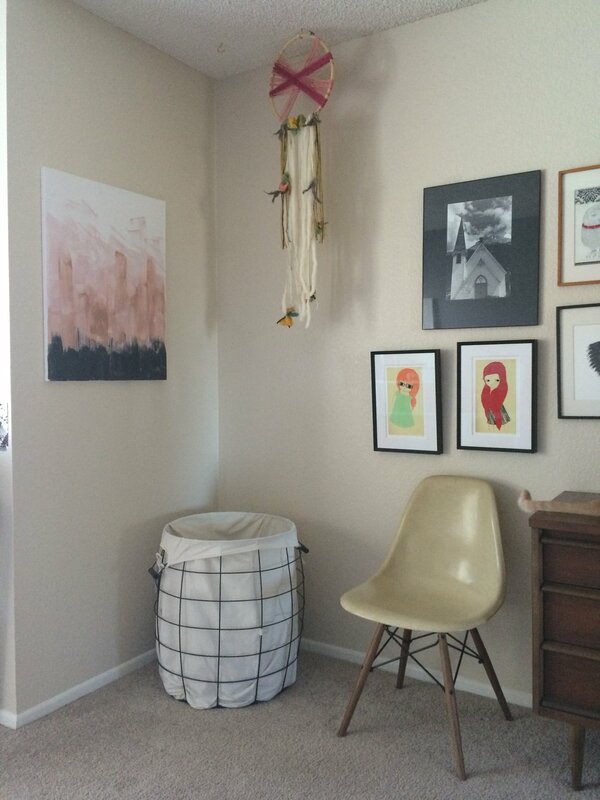 The painting on the wall to the left of the hamper was a quick project that I made myself. Another one of my dream catchers is on display as well. The gallery wall is another collection of etsy prints, and the black and white photograph was done by my dad. The dresser is a midcentury modern estate sale find (a steal at $75! ), and to the left of it you can see my other Eames chair. One of my most prized possessions rests on top of my dresser... the jewelry box made as a gift by my dad. It is so special to me, and inside the bottom drawer is a cd of "our song" with a message from him. The silver container next to the jewelry box is a vintage creamer and I use it to hold my rings. I love our tiny outdoor space. Its just big enough for a few plants, and a couple of chairs from Ikea. My boyfriend and I have a morning ritual of sitting out here with the kitties and drinking coffee. There is no better way to start my day. Most of my plants are ferns and succulents... both of which are hard to kill, which suits me just fine! The turquoise and the gold pots were regular terra cotta pots that I painted. Well that's all for now folks! I hope you enjoyed the tour! Feel free to comment or ask questions on anything that sparks your interest. Hello, Salutations, Cheers, and Welcome!